Where to report a high volume breeder. Ohio Dept of Agriculture 844-820-2234 Monday through Friday from 8:30 a.m. to 5:00 p.m. EST. Puppy Mill: A dog breeder that puts profit before the well-being of a dog. Dogs are housed in overcrowded, unsanitary conditions without adequate veterinary care, food, water and socialization. in New Jersey and move her operation of 250 dogs to Ohio. Question: What are conditions like in so called puppy mills? Answer: Large numbers of breeding dogs kept in cramped cages that are not regularly cleaned. Breeding dogs receive little to no medical treatment, and are not properly socialized either with other dogs or with humans. Such breeders engage in large scale breeding of many different breeds of dogs. These dogs are then sold to consumers without documentation of the dog’s origin or state of health. Puppy mills negatively affect responsible breeders who care for the health, social and behavioral aspects of the dogs and puppies they breed and sell. Puppy mill produced puppies are often sick and born with genetic defects and sold to unsuspecting consumers under the guise of being “registered” and/or “purebred”. Consumers don’t know they are buying a dog born and bred in horrendous conditions. When the breeding dogs have become so ill or bred so much that their uterus collapses, they have been known to be disposed of by drowning, bludgeoning, shooting, surrendered to tax supported dog shelters, or sold at auction. Question: Does Ohio have a puppy mill problem? Answer: Yes. Ohio has over 11,000 kennels. The dog breeding business is not regulated in Ohio. The USDA only regulates wholesale breeders. The USDA has 161 licensed breeders in Ohio (many of which are breeders of animals other than dogs). 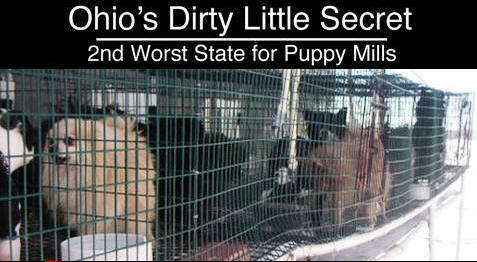 Ohio is second only to Missouri in number of puppy mills. National undercover investigators have called Ohio the worst state for the sanitary conditions that dogs live in. High volume, irresponsible breeders locate in Ohio because there is no regulation that addresses substandard conditions, and the few laws that do exist must be enforced by a county dog warden who lacks the facilities and funds needed to enforce the existing animal cruelty law. This bill will bring change by providing an enforcement entity to address and shut down abusive puppy mill operations in Ohio, so that responsible breeders can flourish, and consumers can be protected. by two front paws. This dog died in from hereditary disease. -Interview of Junior Horton, infamous breeder kicked out of Virginia for deplorable breeding practices. Horton now lives in Coshocton County with over 400 dogs. -1000 dogs removed from West Virginia Breeder Sharon Roberts. She agrees not to breed in W Virginia ever again. She is now living in Washington County Ohio. Washington County Ohio Sheriff found over a quarter of a million dollars in cash in her home. and inspecting of the appropriate number of kennels. Most high volume kennels are not under USDA enforcement because they are not selling wholesale. Ohio is the 2nd worst state for the number of puppy mills in the country and, in the opinion of an undercover investigator who has videoed puppy mills across the nation, Ohio is the worst in the entire country for conditions the dogs live in. Existing Ohio legislation does not provide for public accountability where deplorable conditions exist. Ohio is quickly gaining the reputation as the puppy mill capital of the Midwest. The high volume kennels are the major concern. Reputable breeders, veterinarians and dog enthusiasts continue to embrace the puppy mill language. Minimum standards for dog care (such as unfrozen water bowls, daily feeding, living quarters free from a build up of urine/feces) are a few of the requirements included in the puppy mill legislation. This bill encourages responsible breeding and the raising of dogs for the pet industry. below as to how you can do your part to make sure the Puppy Mill Bill is passed. Estimates suggest OH has a 1 billion dollar breeding business. the dog breeding in Holmes County generates $9 million a year. We believe that to be grossly underestimated. This article from the Indy Star states that 92 Indiana breeders are USDA-registered. Lawmakers and industry experts estimate there are as many as 3,000 commercial dog breeders in the state, fueling a $1.3 billion industry. If Indiana is estimating that 3000 kennels generate 1 billion....then Ohio could be as high as 3 billion in untaxed revenue.